blog.HalloweenAdventure.com | Latest News from the Costumes Trend FrontLines! : TOP FIVE SCARIEST HALLOWEEN COSTUMES FOR GIRLS! TOP FIVE SCARIEST HALLOWEEN COSTUMES FOR GIRLS! We know most girls prefer to be pretty princesses on Halloween, but we also know there are some girls who are just born to be bad and want to rock it scary-style while they Trick or Treat. So, we’ve created a list just for those girls, a list of costumes so scary you might swear you accidentally switched your child with someone’s zombie. 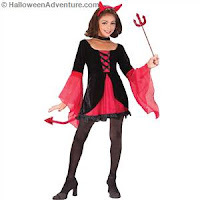 For those who want one foot in the water and one foot out, try our Dazzling Devil Children’s Costume. This Dazzling Devil is adorable in red and black. Dress has black trim hem and criss-cross front panel, and sheer red flowing sleeves. Also included are red headband horns and of course a pointed red tail. Perfect for those who want a little bit of scare and a little bit of pretty! Feeling bad? Try our Snow White Evil Queen Teen Costume. This officially licensed Disney costume is a perfect way to illustrate that you’re smart, evil and you mean business! It features a great bluish purple silk dress with batwing sheer sleeves with gold detailing, as well as a fabulous foam collar, emblem, hood and of course, a crown! If Snow White’s lessons are any indication, a girl in this costume is not to be messed with. 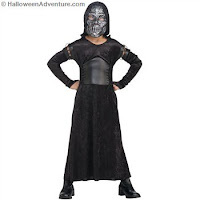 Scary Harry Potter fans will fawn over our Death Eater Bellatrix Children’s Costume. Our Female Death Eater Bellatrix costume comes complete with dress with cummerbund and attached hood, and mask. This costume is perhaps the scariest female costume we’ve got! Just picture Bellatrix broadcast widescreen in the movies with that terribly maniacal laugh. Channel her evil and go to town! Just remember, death eaters may scare younger children, so wear with caution. 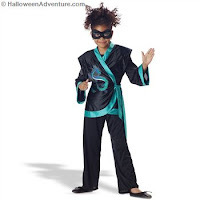 Practice your kung-fu moves in our Jewel Dragon Ninja Costume. This costume is only as scary as you make it, so learning some karate is advisable! You’ve got to be able to show off the skills to match your outfit! Includes a polyester jumpsuit, princess satin vest with character screen print dragon and face mask. Brother and sister teams can rock our Pirate costumes. For girls, check out our Pirate Girl Elite Collection Child Costume. It includes: Mid-length dress, gold trimmed lace-up vinyl vest, tulle petticoat, sash, bandana and jeweled choker. Yo, ho, ho and a bottle of… juice? We know you’re too young for rum, but that doesn’t mean you can rock this bad to the bone costume!